In 1911 a small group of specimens was discovered on Saint Lucia, on the peak of the hardly accessible volcanic cone Petit Piton (743 m). 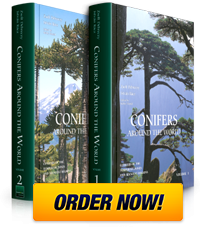 This juniper really is among the world's rarest conifers! - So we had two options: seek for publication-quality photographs and voucher specimens; or get there and document the plant for our projects. Our search for photos and specimens was unsuccessful while finishing Conifers Around the World was a pressuring goal. Finally, it was a team of Hungarian friends, which undertook the adventure of getting to Saint Lucia in the summer of 2006: András Vízy, Zoltán Szmodits, Zoltán Babati, András Sándor, and Attila Ékes. But before, our DendroPress colleague Kinga was good enough to find noted floristic researcher Mr. Roger Graveson on Saint Lucia, whose advice led the team to Melvin, a local guide. With his help the team scaled the peak of Petit Piton, collected samples of the juniper and its associates and brought back a series of precious photos. Some of these are now seen in pages 844 and 848 of Conifers Around the World. Subsequently the associated plants were identified by Roger and the duplicates shipped to Budapest. Thanks for all that we could feature this plant and its homeland in our conifer monograph.